Thank you to Tashie George of IfriMarket for hosting and sponsoring a successful Dinner & Movie fundraiser on November 3. Thank you to our Classroom Heroes who raised $635 to support Liberian Youth in our training courses. Thank you to Taste of Africa for the second (or third) helpings of delicious food. And thank you to the cast and crew of the Out of My Hand movie! About 20 people gathered that day. They learned more about Uniting Distant Stars and how we are helping Liberia’s young men and women gain independence with trade careers. They networked with each other. 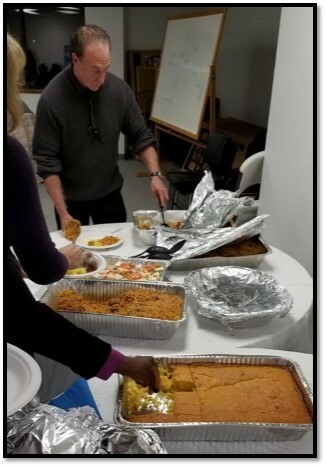 They ate Jollof Rice, potato salad, corn bread, and much more (food table photo take by Boyd Morson). And they sat back and enjoyed an entertaining movie. UDS U.S. 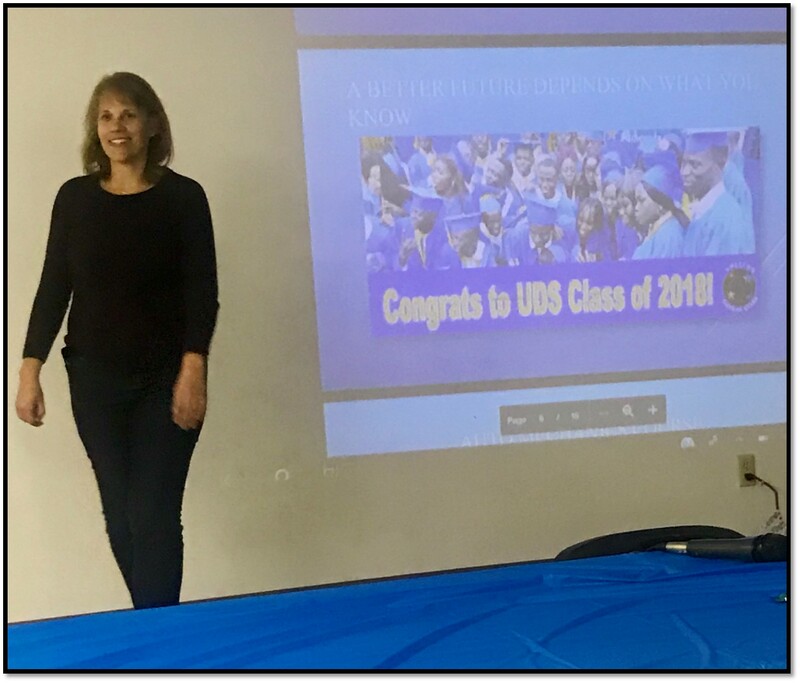 Co-Founder & Executive Director sharing information about our programs and the 75 graduated students of March 2018. Photo taken by Florkime Paye. Tashie is committed to holding this event each year, and we are grateful for her continued support! This entry was posted in Africa, fundraiser, Fundraising, Generosity, Jollof Rice, Liberia, Thank You, Uniting Distant Stars, vocational training, youth development, Youth Empowerment and tagged Fundraiser, Fundraising, IfriMarket, Jollof Rice, Liberia, Out of My Hand Film, Tashie George, Taste of Africa, Thank You, trade school, Vocational Training, Youth Development, Youth Empowerment. Bookmark the permalink. ← Why Should I Hire You Without Any Experience?